We all have a circle of knowledge and on the circumference is our exposure to ignorance. Spend enough time using computers and you’ll realize a few things. For example, my old laptop had a highly-developed means of sensing when I was almost finished and wanted to shut down; processing slowed to a crawl and the last couple of tasks, which should have taken no more than ten minutes, took 30. Pretty sophisticated for a machine whose processing speed was measured in hours and battery life in minutes. One thing I learned early on is that there is almost always more than one way to do any task in a program. Save a file? You could use File|Save from the Menu Toolbar. Or click the Save icon which, oddly, looks like a floppy disk, even though very few new computers come with floppy disk drives. 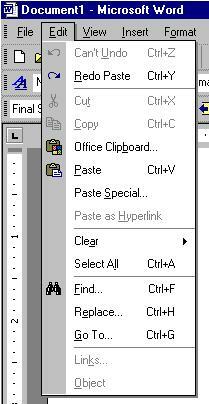 Or just hit Control-S. I’ve done enough copying, pasting and moving of text within documents that Control-C (or Control-X to cut) Control-V is a single swoop of my fingers across the keyboard–and magically the text is in a new location. Yet I’ve met people who rarely copy and paste who use the Menu Toolbar, a method that seems clunky to me but not to them. Which has led me to another realization, much broader in applicability than mere toolbar vs. keystroke preferences: there is almost always more than one effective way to do anything. Anything at all. Just enter the name of a favorite food into your search engine of choice and see how many recipes there are. You may have a favorite, but there are plenty of people who prefer a slightly different version. Having worked at a number of organizations in my career, including some temping, I know this is true in many aspects of our work lives beyond the computer screen. Go work at another company and you’ll find they have a different way of processing payments, reporting problems to the IT department, requesting vacation time–even things as basic as answering phones and delivering mail. (Directly to your desk or to a mailbox?) And the truly remarkable thing is that, for the most part, all of them work! If almost any method of accomplishing a task can work, why does it matter which you use? Well, sometimes it doesn’t. Sometimes work is a “black box” where certain input enters the box and the desired output emerges, and what happens in-between is irrelevant. But often it does matter, not because you couldn’t have done your work equally well some other way but because what you do has to mesh with what went before and what will come after–the other people in your department or your organization who have a role in getting work done. One of the prejudices some employers have against older workers (aside from thinking we cost too much) is that older, more experienced candidates may be perceived as set in their ways. This happens, of course; but it can just as often be true that workers who have been around a while have learned many different ways to accomplish the same tasks. Along the way we’ve learned how to learn by repeatedly needing to re-learn the tools we use to get work done, so that teaching ourselves to do things differently becomes almost second nature. And I suspect this is particularly true of Boomers–those of us who came of age after Gordon Moore observed (in 1965) that the density of circuits on a computer chip doubles every two years, leading to a slew of technological advances in processing speed, capacity of computer storage, and so on. Remember MS-DOS? Then you’ve learned to use at least four new operating systems (assuming you somehow skipped alternate upgrades of Windows) and a comparable number of word processing, spreadsheet and other software versions. Set in your ways? I don’t think so! That’s the metaphor of the Menu Toolbar: there is more than one way to get a task done. Often they work equally well and the only considerations are what is comfortable for you and compatible with your colleagues. And once you’ve learned every task in the Menu, the publisher releases a new version and you have to learn it all over again.